L'Asie divisée en ses principaux Etats … - LATTRÉ / JANVIER, Sr. Title : L'Asie divisée en ses principaux Etats …. Map maker : LATTRÉ / JANVIER, Sr.. Size : 12.0 x 17.5 inches. / 30.4 x 44.4 cm. 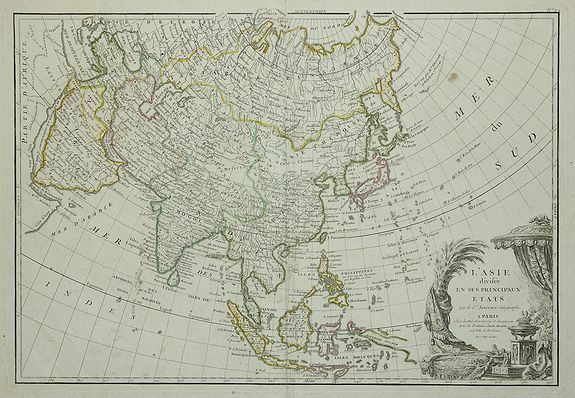 Description :Attractive map of Asia, ornated with a sumptuous title cartouche. Boundaries outlined in hand colour. Condition : Nice printing in very good condition. A spot of paper thinness on the centerfold near the top of the map. A stain on the upper right part. The four corners and the edges of the centerfold reinforced on the back.